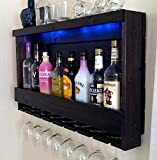 Add a touch of intimate illumination to your next dinner or gathering with these cool new LED Wine Bottle Lights. Inside these corked green wine bottles are 10 warm white LED micro dot bulbs that create pinpoints of light, kinda like a jar of fireflies. These bottle lights are wireless too, just insert 3 AA batteries and flip the switch on the bottom for instant ambiance anywhere you need it. 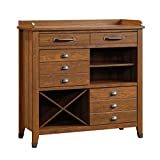 Sauder 414783 Carson Forge Sideboard, L: 40.71" x W: 16.65"